Many people in Santa Clarita, California choose to attempt home faucet repair and replacement without the proper knowledge or tools. While it may seem rather enticing to save money on repairs by spending a weekend making these repairs on your own, if you’re not handy or have a basic understanding of your home’s plumbing system, you may end up stripping parts and causing more damage to your faucet. At Santa Clarita Plumbing Service Pros, we understand that saving money is important. We also know the value of professional plumbing services. It is for these crucial reasons that we go above and beyond to bring affordable kitchen and bathroom faucet replacement to our customers. If you’re struggling with a faulty faucet on your kitchen sink, bathroom sink, in your laundry room, the faucets in your bathtub and shower, or even problems with the valve on your water heater give us a call today. We offer same day service, so you don’t have to be inconvenienced for long. Ask Us about Our Faucet Installation Services! No matter what type of faucet you have, we have the right tools to install the fixture without any problems. If you are ready to upgrade your plumbing, or need a minor repair like an o-ring or gasket replaced, then give us a call today. 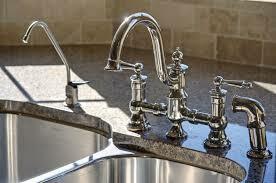 We can even help you with other kitchen plumbing services like garbage disposal repair. We answer our phones around the clock and always make sure that we send the best local contractors to your home!